This website has four parts. Peru has an extraordinary transport heritage. The Peruvian government was the first in South America to issue a franchise for railroad construction, in 1826. 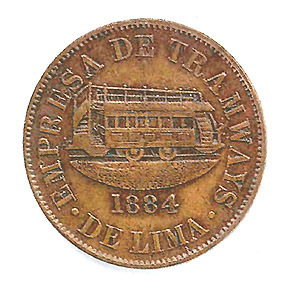 The steam railroad that opened in 1851 between Lima and Callao was the second in South America (after Guyana in 1848). 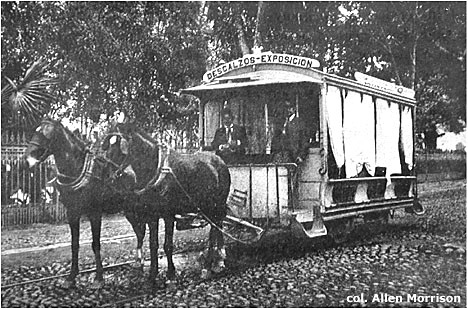 The street railway which began carrying passengers in 1864 between Callao and La Punta was one of the continent's first animal-powered lines. 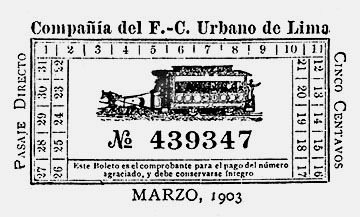 The horsecars that entered service in Lima in 1878 had a unique design. 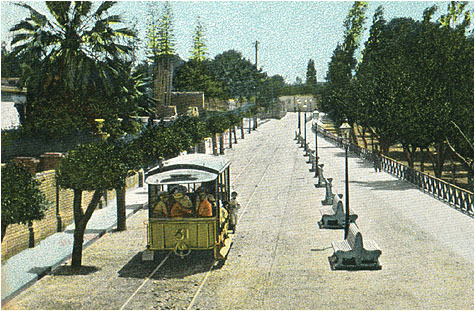 A funicular in suburban Chorrillos was the first on the continent and may have been the only funicular anywhere to use a side-winding cable. 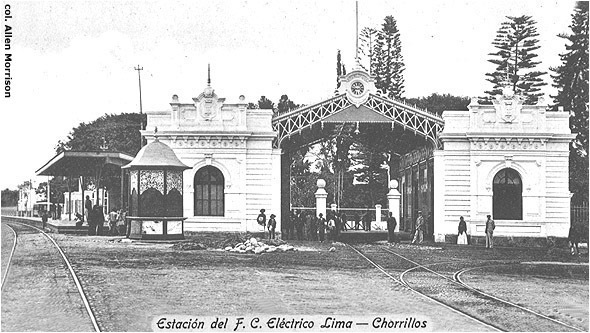 Chorrillos was connected with Lima by three separate electric railways. 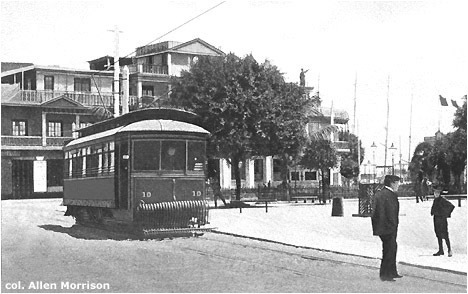 Some of Lima's trams used trolley poles, others used bow collectors and still others carried pantographs. Lima inaugurated the world's first battery-powered bus service in 1905. In 1928 it opened Latin America's first trolleybus line - then rebuilt the trolleybuses as trams! A new tren eléctrico opened in its suburbs in 1990 (and has carried passengers from time to time). Lima's original tramway network closed in 1965, but five blocks of track reopened in 1997! This webpage examines some of these lines. Lima sprawls along a plain between the Pacific Ocean and the Andes, 12° south of the Equator. The old Spanish Ciudad de los Reyes (City of Kings) is 13 km from Callao, Peru's chief port [see map]. 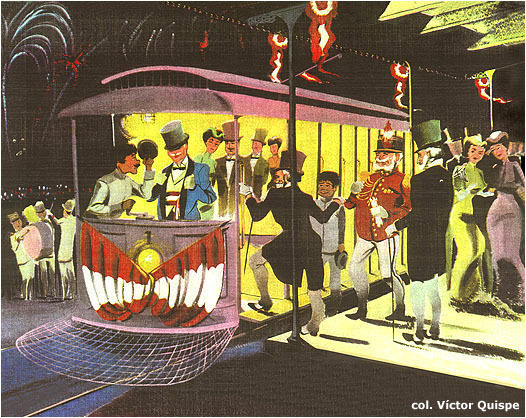 Five steam railways opened in the 19th century between Lima and its coastal suburbs and electric tramways followed parallel routes in the 20th. 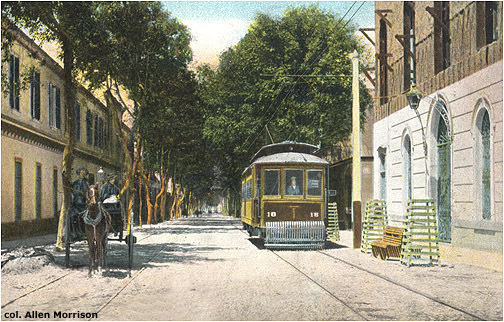 The Lima tramway system consisted of these suburban lines and local tram services in Lima, Callao, Miraflores, Barranco and Chorrillos. Peru's first animal-powered tramway was inaugurated in 1864 between Callao and La Punta [see map]. Operator was the Junta de la Beneficencia (Welfare Board), track gauge was 1435 mm and, according to historian Alberto Regal [see BIBLIOGRAPHY, below], a Callao company named Heuner built the first three cars. Unfortunately, despite great effort, no illustrations or other information about this pioneer line could be found. 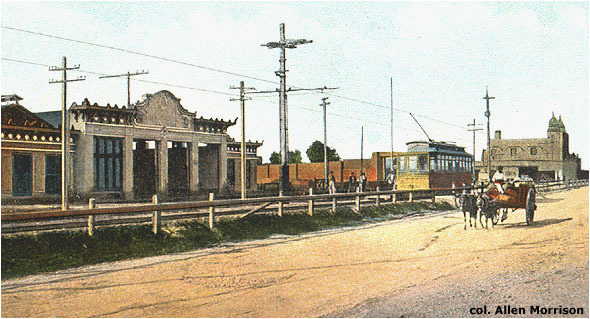 The suburban tram lines fed the steam railroads that connected Lima with the coast. 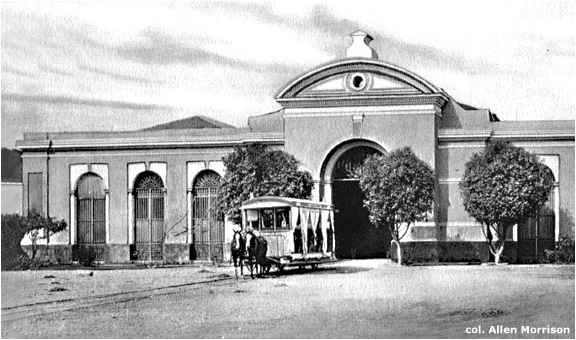 The English-owned Lima Railways Co. (Ferrocarril Inglés) operated the 1851 line from Lima to Callao and another built in 1858 to Chorrillos. Ferrocarril Central del Perú built another railroad to Callao in 1870 and there were two separate lines to Magdalena, one of which sometimes used animal power. 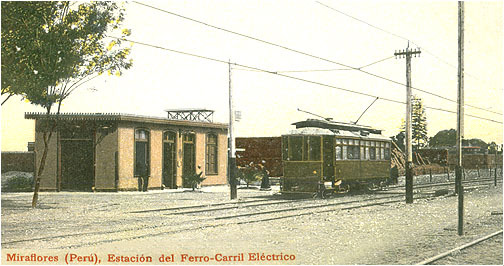 The horsecar line alongside the Lima Railways steam line to Chorrillos also opened in 1904, and was later electrified [see Part 2]. 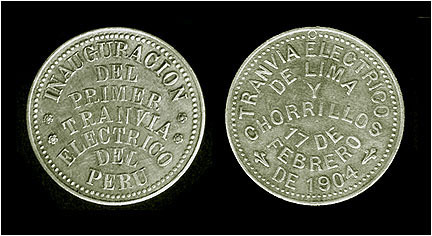 Both Lima Railways routes, to Chorrillos and Callao, were also later electrified [see Part 3]. 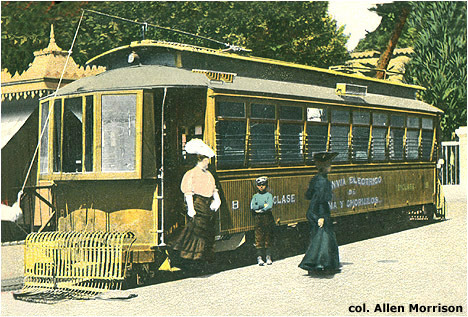 The author is grateful to Lima resident Elio Galessio for information about his city and the railways and tramways that ran there. He is also indebted to Harold E. Cox of Wilkes-Barre for information about tram car orders. Juan de Arona [Pedro Paz Soldán y Unanue]. La Línea de Chorrillos: Descripción de los Tres Principales Balnearios Marítimos que Rodean a Lima. 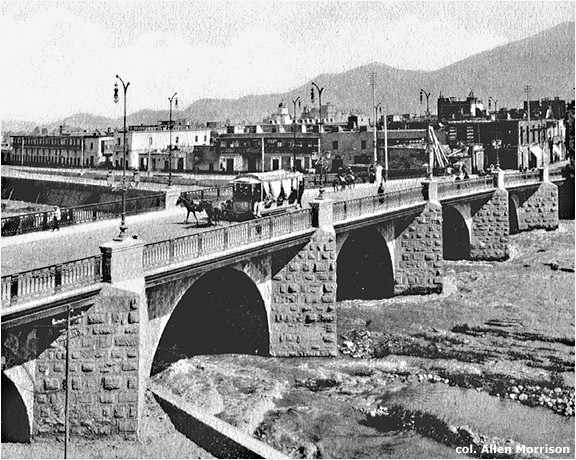 Lima, 1894. Information about the Barranco funicular and the Barranco-Chorrillos horsecar line, pp. 29-30 and 38-39; description of the Chorrillos-Villa horsecar line, pp. 66-67. Santiago M. Basurco. Plano del Callao. [Callao], 1900. Callao street map at scale 1:10,000 shows routes of the two steam railroads and also the animal tramway of the Beneficencia. "El Tranvía Eléctrico" in Actualidades (Lima) #56 of 29/2/1904 [pages unnumbered]. Four pages on the inauguration of the Chorrillos line. Nice photographs. "First Electric Railway in Peru" in Street Railway Journal (New York), 4/6/1904, pp. 851-852. Description of the Chorrillos line and its trams. Five photographs. "Tracción Eléctrica" in Actualidades (Lima) #75 of 7/8/1904 [pages unnumbered]. Two pages on the inauguration of the Callao line. Three excellent photographs. F. Fajardo. Plano del Callao en relación con los Años 1855, 1870 y 1905. [Callao], n.d. . Callao street map shows the two steam railroads and also the interurban and local lines of the new "Tranvía Eléctrico". Empresas Eléctricas Asociadas. Plano General de los Ferrocarriles Eléctricos de Lima, Callao y Chorrillos. Lima, n.d. . Map at scale 1:50,000 shows all tram lines in the area, including (despite title) steam and animal-powered. Camilo Vallejos Z. Plano Topográfico de Lima, Callao y sus Alrededores. Lima, 1907. Map at scale 1:80,000 shows "ferrocarriles a vapor y eléctricos". "The Electric Tramway System of Lima, Peru" in Street Railway Journal (New York), 4/5/1907, pp. 792-795. History and description of the electric lines and the formation of Empresas Eléctricas Asociadas. Eight photograph, a map and a diagram of the track layout in the carbarn. Ricardo Tizón i Bueno. Plano de Lima, 1908. Lima, n.d. . Superb map at scale 1:10,000 shows tram lines in central area, identified by letter. Only map found that shows and identifies the new CNTE electric line [see Part 2]. Concejo Provincial. Plano Oficial de la Ciudad de Lima en 1921. Lima, 1921. Street map of the central area shows track detail of the tram routes. Santiago Antúnez de Mayolo. La Génesis de los Servicios Eléctricos de Lima. Lima, 1929. 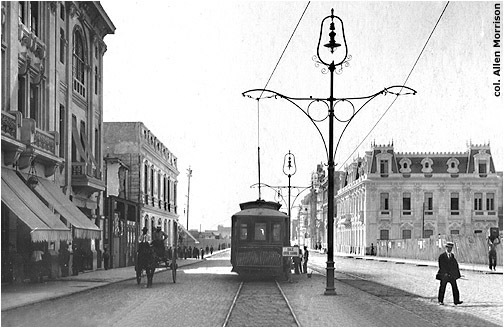 Excellent survey of the development of electricity and electric transport in Lima. Four photographs. Lascano & López. Plano de Lima, Callao y Balnearios. From its Guía Lascano. Lima, n.d. [about 1929]. Large map of entire city shows tramway and railway lines in detail. Alberto Regal. Historia de los Ferrocarriles de Lima. Lima, 1965. A monumental work. History and description of all the railways and tramways in the Lima area, including the Callao local lines (chapter V); Lima local lines (IX); Lima-Chorrillos lines (X); Lima-Callao line (XI); Lima-Magdalena lines (VIII). Numerous photographs and wonderful maps. Municipalidad de Lima Metropolitana. Planos de Lima, 1613-1983. Lima, 1983. Folio of 30 maps, many showing tram routes. Juan Carlos Arroyo Ferreyros. "El Tranvía" in Concertando (Lima), 9-10/1994, pp. 7-10. Good historical survey. Data mostly from Regal, above. Four photos, seven charts. Trevor H. Stephenson. Peruvian Trams and Railways: An Illustrated History. London, 1995. 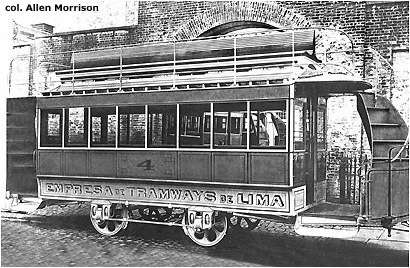 Lima railways and tramways, pp. 23-57. Brief text, unidentified illustrations, maps copied (without credit) from the Regal work noted above. César Jiménez. Historias de los tranvías en Lima. Nice historical survey of tramway development. Text, 12 photographs, diagrams of the urban lines, enlargeable map of the suburban network.